Welome to Plant Exchange Blog where share about plants of the USDA Zone 4-5a and people who grow them. If you’ve kept a thriving plant container watered in a dry, hot summer, you can imagine the moisture needs of plants in your garden. Of course plants in the ground don’t require as much water as containers because there’s less evaporation. Still, we see the challenge for plants to get adequate moisture in these dry times of the season. Some plants just require less water by how they adapted where they are found naturally. Sedums, succulents, native grasses and cacti often require much less water. These are an option for saving money on water bills and can be attractive in areas of the yard. 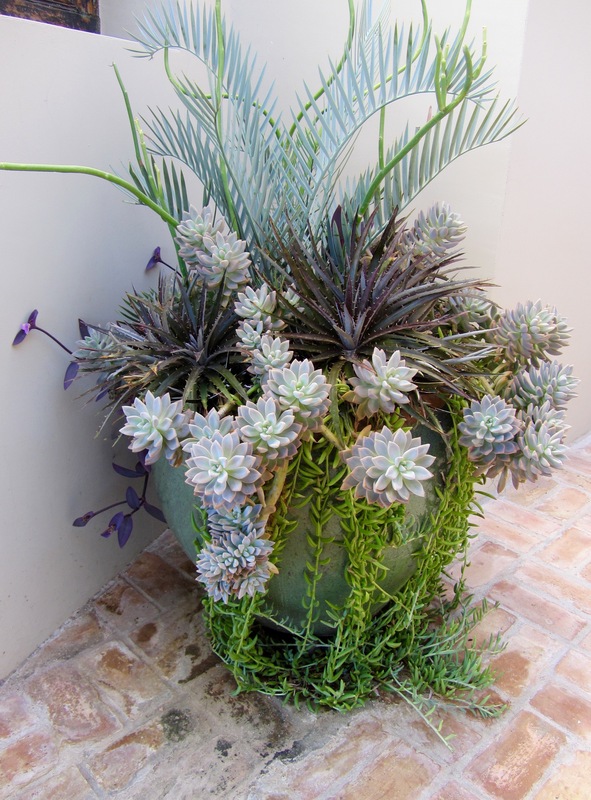 One way to add drought tolerant plants is by growing them in containers. In the example below, foliage is more prominent than colors of blooms, but adds variety of shapes with muted color.